Thandai is a traditional festival drink made with exotic spices and nuts. It is quite popular drink in Uttar Pradesh and Rajasthan or Northwest Region. This fresh and homemade thandai mixture makes thandai more tasty and heavenly. You can keep this homemade thandai paste in refrigerator. You can enjoy the drink as it is without straining. 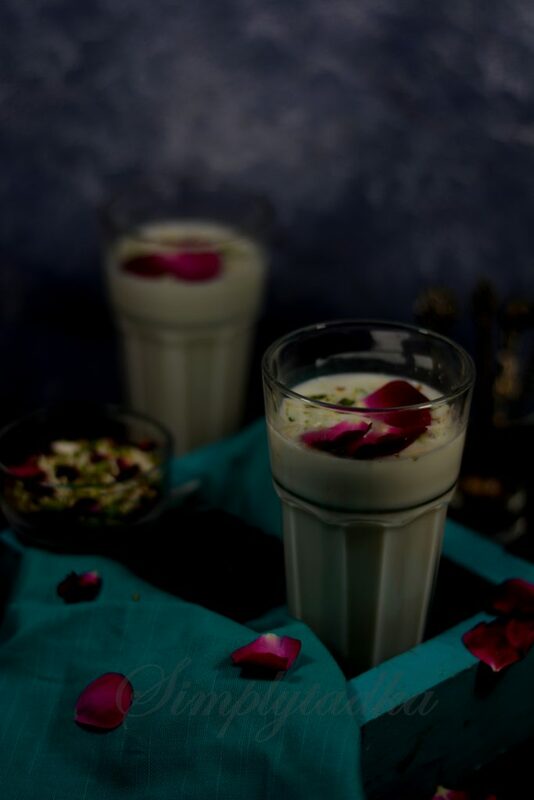 Thandai or Shardai is an Indian milk based drink which prepared with a mixture of almonds, cashews, raisins, fennel seeds, melon seeds, rose petals, pepper , cardamom, saffron and milk. It is Indian origin and generally associated with Maha Shivratri and Holi festival. There are variants of thandai and the most common are badam thandai, kesar thandai and bhaang thandai. Some other flavors of thandais are rose thandai, mango thandai, paan thandai and many more. Try alternate recipe from Milk: Golden Milk Smoothie, Badam Dhoodh, Hot Chocolate and more. Soak the cashew, almonds, raisins, cardamom, black pepper, saunf, poppy seeds, and melon seeds in water for overnight or atleast 5 hrs. Drain the water and grind the soaked nuts till smooth paste in a grinder or blender. Add thandai paste into milk and mix well. Strain the thandai paste. Add sugar, saffron, rose water and kewara essence and mix well. Pour the thandai in individual glasses and garnish with rose petals and chopped nuts. Serve chilled. 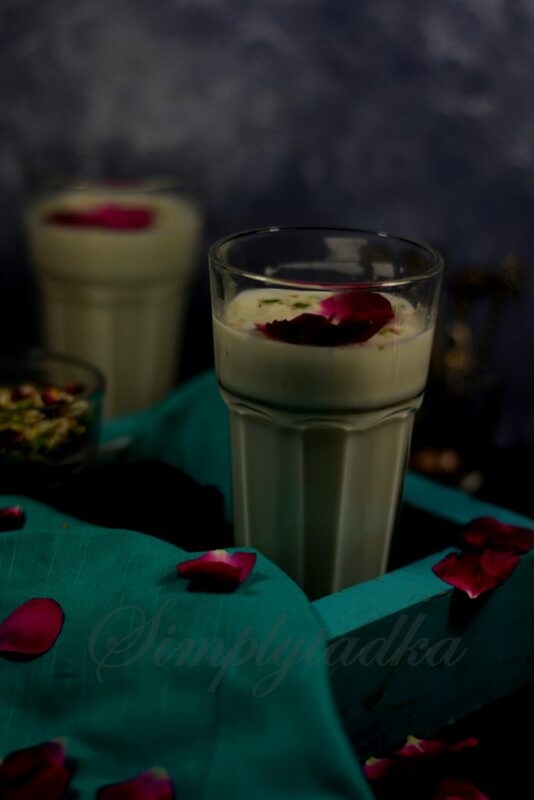 Thandai is a traditional festival drink made with exotic spices and nuts. It is quite popular drink in Uttar Pradesh and Rajasthan. Soak the cashew, almonds, raisins, cardamom, black pepper, saunf, poppy seeds, and melon seeds in water for overnight or atleast 5 hrs. Drain the water and grind the soaked nuts till smooth paste in a grinder or blender. Add thandai paste into milk and mix well. Strain the thandai paste. Add sugar, saffron, rose water and kewara essence and mix well. Pour the thandai in individual glasses. Garnish with rose petals and chopped nuts. 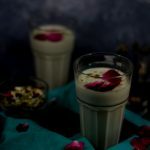 The pictures look amazing and make me want to grab it off the screen, very well taken Preeti…love this drink. As soon as I read Thandai I became nostalgic ! Mom used to make one of the best Thandai . It’s a real exotic drink and so rich and flavourful . Drooling over these glasses . Thandai is my favorite. Need to make it soon. Between love the dark and moody shots. Looks absolutely delicious..perfect for the holi season.. This would be awesome during summer. All those ingredients together sounds so flavorful. Such a festive looking beverage. The nuts and rose petals add to the richness. Love this drink and I know that it is popular during the Holi season. 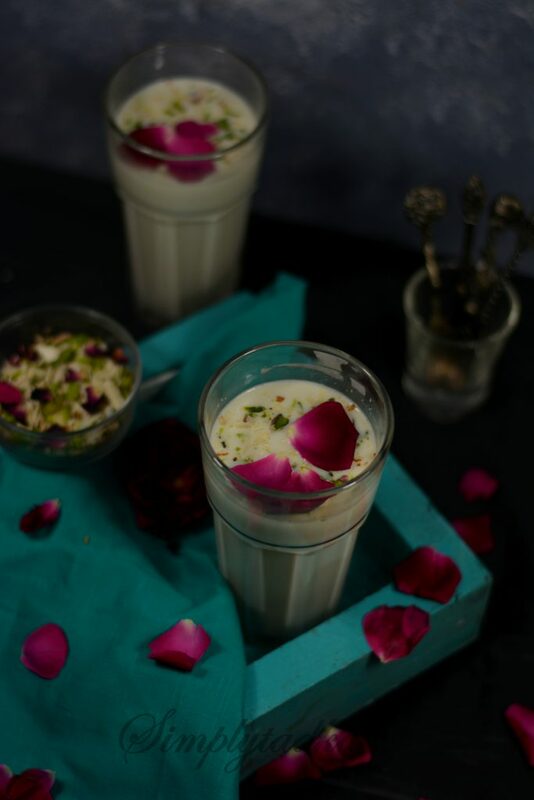 Wow, thandai looks very delicious and perfect drink for the coming Holi. I love the way you presented.